The declaration of independence from Spain by Catalonia this month, sets a precedence that is likely to be repeated elsewhere in Europe. As the memories of war and economic deprivation from the middle of the last century fade, the resurgence of nationalism should of been expected. 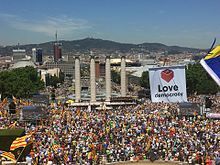 The violent crackdown by the Spanish government to head off a referendum for political separation, has an all too familiar story attached to it. Although over 90% of voters in Spanish Catalonia chose independence in the referendum, according to authorities there, only about half of the eligible electorate was able or decided to participate in the electoral process. This makes the results more questionable and ambiguous, as the Spanish government refuses to acknowledge the legitimacy of the process. Pro-referendum rally in Montjuic, 11 June 2017. In addition, as in any case of political separation, there still remains the question of economic viability and long term financial sustainability. Political leadership elsewhere in Europe, is still hoping for a reconciliation between the Catalans and the Spanish central government. It is obvious though, the sympathy lies with the regime in Madrid. At the same time, it is difficult to just dismiss, the democratic process in voting when it is inconvenient, as in a case for self-determination in Catalonia and elsewhere. European nationalist movements leading to war and economic dislocation in the West, were seen in many political circles, as relics of the previous century. 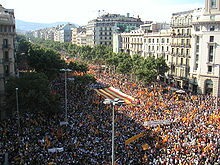 The 2010 Catalan autonomy protest in the intersection of Passeig de Gràcia and Aragó Avenues, in Barcelona. Events in Catalonia remain an unpleasant reminder, of the state of affairs in Europe, just two generations ago. As the continent emerged from the ashes of the Second World War in 1945, it was not long before the major countries of Western Europe decided, that cooperation and unity among them, would be the best way to prevent a future conflict. These early steps created the foundation for what would become first a common market in 1957 and then the European Union (EU) in 1993. 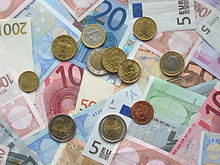 A common currency adopted in 1999, is now by far the most widely used in Europe, with a full 19 out of the 28 members states having already completed the conversion. Only two nations, Denmark and the United Kingdom, had negotiated opt-outs, so they could maintain their own currencies. As the latter is in the process of leaving the EU, having voting in what has now become known as the Brexit, only the Danes will stay outside the Eurozone. All the other countries within the European Union are now obliged to adopt the Euro, once certain financial criteria are met. 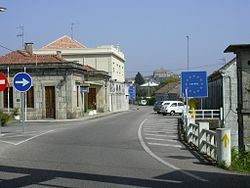 A simple sign marks the Schengen border between Spain and Portugal. The Schengen Agreement, effectively eliminated border checks among member nations beginning in 1995. It was felt that with the new freedom of movement of goods, ideas and people there was no longer any need for the delineation of frontiers. 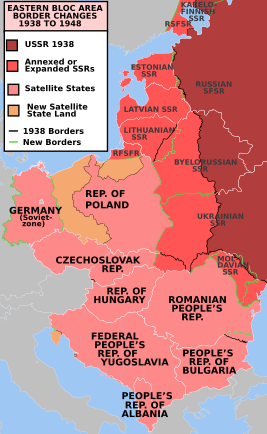 As the early steps towards economic and later political integration continued in Western Europe, the nation states in the central and eastern part of Europe, remained practically frozen in the political Cold War between the United States and the former Soviet Union. When there was a relaxation of international tensions in the late 1980’s, the newly independent states in Eastern Europe, soon resumed a natural political development for the region. Without the imposition of the outside control, provided by the Soviet Union and its Communist ideology, an unraveling of the post war order began in earnest. The EU leadership in Western Europe watched with dismay, as the earlier promise of peaceful economic and political development, began to fray in a number of countries. Dreams of rapid EU expansion into the former Communist nations of Eastern Europe, would soon be precluded in a number of areas. The peaceful reunion of Germany in 1990, was quickly followed by the political divorce between the Czechs and the Slovaks, in the former Czechoslovakia the following year. In the former Yugoslavia, destructive ethnically-based wars and insurgencies began in 1991 and would continue for the next decade. The constituent republics of Yugoslavia began to declare independence in rapid sequence, but the ethnic minorities within these newly independent countries, complicated matters enormously. Although the central government of Yugoslavia dominated by the Serbs, attempted to hold the country together, it was largely a futile effort. Sizable minorities of Albanians, Croats, and Serbians in the new states, would be a politically destabilizing factor, as new republics would emerge and be recognized internationally. Where there was a minimum of minority presence as in the case of Slovenia, independence was for the most part quick and peaceful. What is today known as the Ten-Day War in 1991, ended with a speedy realization, that the Yugoslav army had become an occupying force and would be subsequently forced to withdraw. There were far more important matters for the army to deal with to the south and east. Most of the civil wars within the newly independent republics, would eventually end through peace accords and international recognition. Unfortunately, this outcome would only arrive after numerous civilian casualties and massive economic damage to the region. This would become the fate of the populace in large portions of both Bosnia-Herzegovina and Croatia. 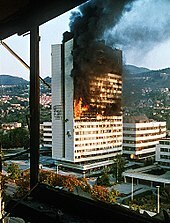 The building of the executive council building in Sarajevo burns after being hit by Serbian tank fire in 1992. As what was left of Yugoslavia fragmented further, it had become clear by 1994, that the Serbs were no longer as interested in preserving central authority, but to create a Greater Serbia from parts of Bosnia and Croatia. They also wanted to maintain political control, over the autonomous areas of the mostly ethnically Albanian Kosovo, as well as the Hungarian minority in Vojvodina. The Serbian attempt to expand their area of control, led to the first case of genocide in Europe, since the end of World War II. The inter-ethnic conflicts would begin in Croatia and then would expand enormously in Bosnia-Herzegovina, where Bosnian Muslims civilians would be massacred by separatist Serbian forces. The war in the western parts of the former Yugoslavia, would end with the United States sponsored peace talks known as the Dayton Accords in 1995. The Kosovo War started in 1996 and finally ended with the 1999 bombing of Yugoslavia, which now was only comprised of Montenegro and Serbia. The former would become independent in 2006, ending the last vestige of unity. 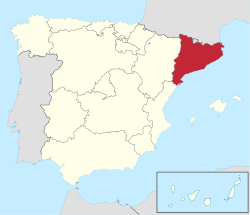 Location of Catalonia on a map of Spain. Kosovo would declare independence from Serbia itself, in 2008. Although most of the European Union, the United States and the United Kingdom, would recognize this political act in self-determination, other nations would refuse to accept the results. This would include the nations of China, Russia and notably Spain. Catalonia’s drive for secession from Spain is reawakening dreams of independence in other areas of the continent, especially in Eastern Europe. The Balkans in particular, are watching events in the Iberian peninsula, to see what lessons can be learned from there. Ethnic Albanians in the southern portion of Serbia and the Serbs residing in the Republic of Srpska, located in Bosnia-Herzegovina, are the most enthusiastic to take their nationalist movement to a logical conclusion. There are also rumblings among the Hungarians in Vojvodina. These minority groups take courage, from the actions Kosovo took nearly a decade ago. It also exposes the many sides of the argument, in the quest for self-determination throughout Europe. 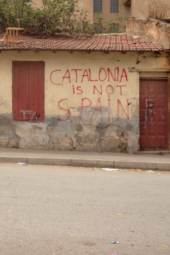 Catalonia is not Spain painted on a wall in Catalonia. The European Union considers the referendum that took place in Catalonia illegal. Therefore, if the territory became independent, continued membership in the trading bloc is not clear. Spain as a full fledged member, would oppose any special privilege, that may be provided to this breakaway region. Furthermore, the EU leadership in Brussels does not want to create a precedence, that will undoubtedly be attempted elsewhere. There are already claims of an EU double standard, where Kosovo is concerned. Although the EU insists Kosovo is a special case, it has continued to sour relations between the bloc and Serbia. The Serbs are correct, when they point out a referendum on independence, was never held in Kosovo. They also insist the 11 week NATO (North Atlantic Treaty Organization) bombing campaign was an illegal way, to force their evacuation, from their sovereign territory of Kosovo. The Serbian population living in northern Kosovo, were never consulted on their new political status either. Of course it is also true, that the 1992 ethnic Albanian referendum on separation in southern Serbia, has been largely ignored by both the Serbs and the international community. Romani flag created in 1933 and accepted by the 1971 World Romani Congress. There are other large minority groups, living in various nations states in Eastern Europe. Romania has well over a million Hungarians living within their borders, which compromise over 6% of the total population. Nearly 9% of the population of Bulgaria is Turkish, with close to 5% being of Roma ancestry. These two large minorities have created political difficulties, within the country. Further to the West, there are some nationalist grievances among some of the local population in the Basque and Galicia regions of Spain, as well as the dispute between Flanders and Wallonia in Belgium. You also have a strong German presence in the South Tyrol, which Italy is in possession of. Both the Italian islands of Sardinia and Sicily, have a long tradition of nationalist feeling. 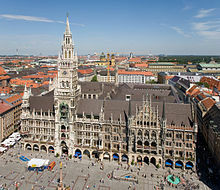 City government building of Munich, the capital of Bavaria, Germany. In France, there are strong historical reasons for self-determination in Brittany, Normandy and Occitania. Even in Germany, you have the Free State of Bavaria. Elsewhere, the massive forced migration of Germans from Eastern Europe after World War II, has added a large influx of people, which has somewhat reduced the former strong regionalism of the country. The case in Scotland, is somewhat more complicated. One of the latest impetuses for separation there, is the fact that United Kingdom as a whole, voted by referendum to leave the EU. Through the process of the Brexit, the nearly 5 ½ million Scots are being forced out of the EU, largely against their will. 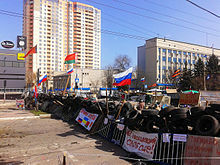 Separatist barricade in Luhansk city. The EU leadership does strongly oppose any police or military action, in changing European political boundaries. The 2014 invasion and annexation, of the Ukrainian territory of Crimea by Russia, was as a result, most vociferously condemned. The further Russian involvement the same year, in the separatist movement in the eastern regions of Ukraine, was decried as well. Known collectively as the Donbass, the Ukrainian provinces of Donetsk and Luhansk, which are predominated by Russian speakers, have rebelled against the central government. They have since become both economically and politically more Russian than Ukrainian. It has led to EU wide economic and political sanctions on Russia, that remain in force to this day. 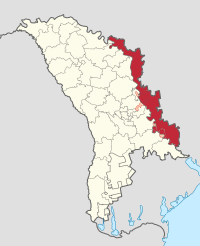 This also further justifies the EU support of Moldova this past summer, in demanding that Russia withdraw its military presence, from its own breakaway region of Transnistria, after a 25 year involvement. 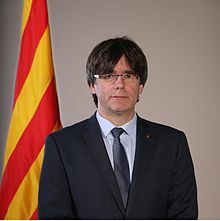 Although there is still strong EU support of the Spanish government in Madrid, there has been a general consensus, that the strong armed military style tactics employed by Prime Minister Mariano Rajoy, have been detrimental for a peaceful solution to the crisis. The European Union already has a strong regional policy. This is evidenced by the rather large investment projects in local communities, which often bypass the national government preferences. It explains why many heads of countries, do not endorse the creeping federalism of the EU. The more European wide laws and regulations put into practice, the less need for the government of the individual nation. 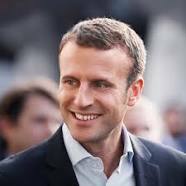 The recent call by the newly elected French President Macron for a common European budget, military force, immigration and tax policies and even transnational elections, are an anathema to more than just a few heads of state. As Europe becomes more integrated, the need for the present nation state configuration, becomes far less important. A new type of sovereignty may arise, one that strengthens the political participation of large cities and regions. This ideal is not welcome, to those who still cling to the traditional European nation-states.